AARP Magazine for Jan/Feb 2010 has an article on the current revival of interest in vinyl (long playing) records (How Records Got Their Groove Back, by Bill Newcott). — Much of the material published on LPs was never issued on CD — true. — CD sales are diminishing as people are playing downloaded MP3 files on their iPods — true. — Having already committed to the flawed medium of digital sound, we should abandon it and start buying LPs again — Why??? 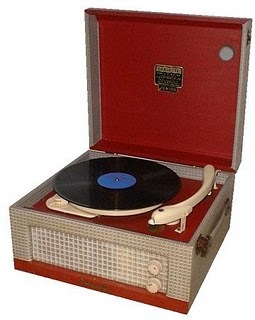 — Because the sound of LPs is actually more satisfying than any digital recordings — Hmmm! “But here’s my theory: it’s the unique imperfections of each vinyl record that make it irreplaceable. After enough plays, a record becomes a fingerprint of your listening experience. Just about everyone who owned the Beatles’ White Album wore the thing down to a nub. Your copy, like mine, is a crackling mess through “Cry Baby Cry”—but then it becomes a mint-condition collector’s item the moment that unlistenable jumble of sounds the Lads called “Revolution 9” fades in. Now 25 years later we are being told that LPs are better than CDs, and the reasoning is the opposite of the argument that was used to kill the medium off in the first place. This reminds me of the length of hems on ladies skirts, or whether men should wear double- or single-breasted suits, with or without turnups on the trousers. In other words, what distinguishes the CD and LP, digital and analog media, is a question of rotating fashion and has nothing to do with any objective technical argument. The reality is that CDs were invented in the nick of time in the 1980s to revive a faltering recording industry that couldnt sell LPs, the technical quality of which had diminished over the previous decade. Today, when CD sales are down, the companies that are still in business are hoping that we have forgotten what they said then, and are trying to convince us that LPs are really better and that, having completely disposed our collection of vinyl records we should now stock up on them again. I would be the last person to suggest that there is no pleasure to be had from listening to LPs, but in my opinion analog v. digital is not the issue here. It is high time that the remaining record companies started to realize that it is music and not technology that sells records, and concentrated on signing performers in the same league as The Beatles, Klemperer, Bernstein, Barbirolli, Horowitz, Callas, etc, on whose reissued performances they have been dining out during the past quarter century of the CD era. Since writing the above, I have had the opportunity to listen again to LPs made in the 1960s, The Golden Age of Stereo. I replaced my old Goldring Lenco GL88 turntable with a Thorens TD124 on a solid plinth and was amazed at the clearer sound that resulted. I also upgraded my cartridge to a Blue Point Special EVO III, though I have found no need to replace the preamplifier that I designed and published in Hi-Fi News in September 1970. There are many second hand record stores where I live; prices are ridiculously cheap and I make regular trips to them all. It is amazing that one can buy classical LPs that are 50 years old, and they often still play without a single scratch. (This can only be due to the great care that their owners took of them.) Pre oil crisis LPs are thick and flat, and some of them actually do sound better than their CD reincarnations. Among these is Wagner’s Ring in the Decca recording by Sir Georg Solti and John Culshaw. I shall write more about actual comparisons of LP and CD versions in the near future. So, have I done a volte face? Do I now believe that LPs are better than CDs? Yes and No. I will state categorically that digital media can reproduce an excellent recording more accurately than an LP. This is due to the Physics of the matter, and every analog master tape that I have heard has sounded better than the LP cut from it. The problem with CDs is that they are limited to 16-bits — a resolution that is exceeded by a good LP — and most of the classical repertoire requires a higher resolution than that. One can test the truth of this by comparing CDs with downloaded high resolution (24-bit) FLAC files of the same recording. The other reason why CDs often do not sound as good as the LPs that were issued of the same recordings is that the engineers and/or the producers of these digital versions do not always take enough trouble to ensure that the sound matches the original discs. There are magnificent exceptions, of course; but later reissues in the form of SACDs, BluRay discs or FLAC files are often, though not always, superior.